Sydney Shop Girl: Wordless Wednesday. 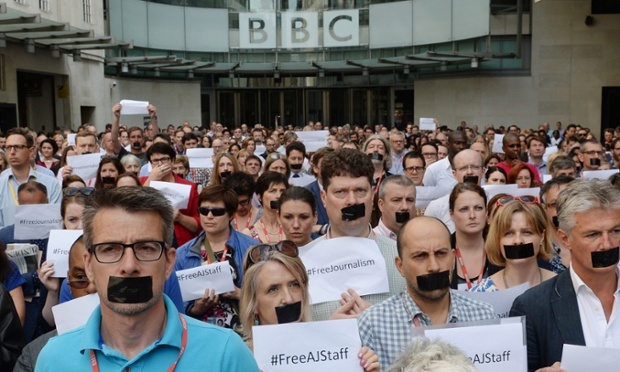 Wordless because this picture says it all for Peter Greste, Mohamed Fahmy and Baher Mohamed. And wordless because that is what free speech will become if journalists continue to be arrested and imprisoned. Which leaves the pictures to tell the stories that have to be told. Well said! Or illustrated? Regardless, I agree. Hope you're travelling well with baby T.
We are gutted for all the journalists here at my chalkface. Peter Greste in his school days was the School Captain. This year, staff have contacted Peter's loving parents. Our Principal has been amazing and has spoken out with the respect and dignity needed to support this unjust detainment. We have a petition on the website Indooroopilly State High and Amnesty has one, too. It could make a difference to sign it. Thank you, SSG. Thank you for taking the time to create more awareness of what we can do to help.